Grew up 5mL of culture from re-streaked colony #1 in 1xLB + 100ug/mL of ampicillin @ 37C on a rocking platform in a 15mL conical over night (~18hrs). 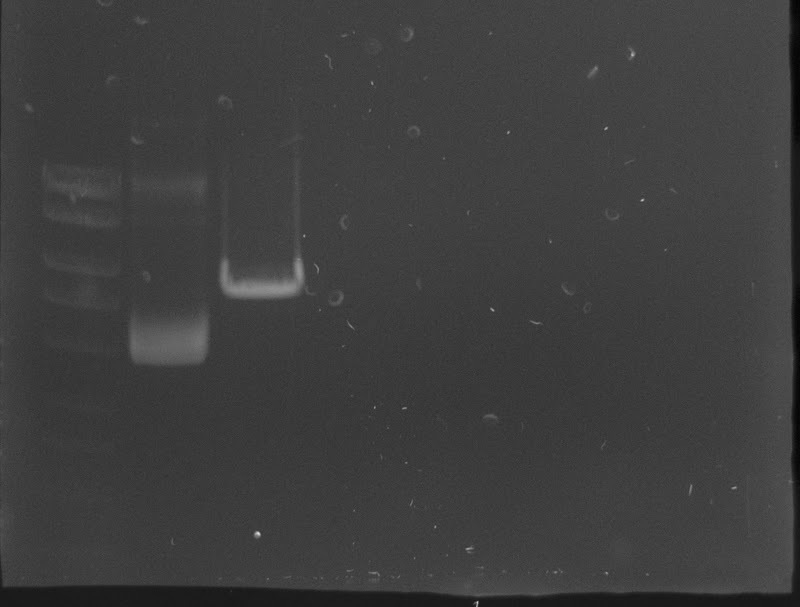 Isolated plasmid DNA from the entire 5mL of culture (repeated pelleting of bacteria in the same 1.5mL snap cap tube) using the QIAprep Spin Miniprep Kit, according to their protocol. Quantified on the Roberts Lab Qubit 3.0 using the dsDNA BR Kit (broad range) and 1uL of sample. The results are not good. Using 1uL of the sample, I received an error message that the concentration was out of range – too low! Repeated, but used 10uL of sample. Concentration was displayed as 1.13ng/uL!! This is insufficient yield/concentration for sequencing. It’s possible that the kit is too old (no receipt date marked on the box…)? The reagents shouldn’t go bad, but can the columns? I feel like the resins in the columns are pretty stable, just like the various buffers. The ridiculously low yields could also possibly indicate that the bacteria don’t actually have the plasmid, but PCRs from yesterday suggest otherwise. And/or make fresh stock of ampicillin (current stock is many years old, but has been frozen). Clone #1 was selected from each of the screened clones. A sterile pipette tip was used to inoculate 5mL of 1x LBAmp100 in a 15mL conical tube. The tubes were incubated O/N @ 37C on a rocker. 3mL of liquid culture was used as input for plasmid isolation with the QIAprep Spin Mini Kit (Qiagen) according to the manufacturer’s protocol. 1mL of each culture was combined with 1mL of 50% sterile glycerol (25% glycerol final concentration) and stored @ -80C with existing bacterial stocks. Plasmid DNA was eluted with 50μL of Buffer EB and quantified on the Roberts Lab NanoDrop1000 (ThermoFisher) in order to have a rough idea of concentrations to submit for Sanger sequencing. A dye-based quantification will be performed after sequencing results are back in order to obtain a more accurate assessment for use in ISH and/or qPCR standard curve creation. Quality (260/280 & 260/230 ratios) look great and yields are more than sufficient. Will prep samples for Sanger sequencing. Prepared 1x LB + 50μg/mL ampicillin. Aliquoted 5mL of LB-Amp50 liquid media to 18 15mL conical tubes. Used the restreaked plates created 20150207 and used sterile pipette tips to select each of the six positive colonies from each cloning reaction and inoculate 5mL of LB-Amp50 liquid media. Tubes were incubated O/N @ 37C on a rocker. All cultures grew. Three milliliters from each culture were used to isolate plasmid DNA using the QIAprep Spin Mini Kit (Qiagen). Samples were eluted with 50μL Buffer EB. Frozen bacterial stocks were made from each of the six clones, using 500μL of each bacterial culture + 500μL of sterile, 50% glycerol in 2mL screw cap tubes. Plasmid preps were quantified on the Roberts Lab NanoDrop1000. Selected colonies 1, 2 & 3 from the colony screens from 20131205 for plasmid isolation. 5mL of liquid cultures were grown O/N at 37C. 1mL of each culture was mixed with 1mL of sterile 50% glycerol solution and stored @ -80C. 3mL of each culture was used for plasmid isolation. Plasmids were isolated using the Qiaprep Mini Spin Kit (Qiagen) according to protocol. Plasmids were eluted with 50uL of Buffer EB. From cloning on 20140908, inoculated 5mL of 1x LB + 100ug/mL ampicillin with pCR2.1/ORF20 clone # 7 and pCR2.1/ORF25 clone #1. Incubated O/N @ 37C on rocker. Isolated plasmids with QIAprep Mini Kit (Qiagen) according to the manufacturer’s spin protocol, using ~3mL of culture. Eluted plasmid DNA with 100uL of EB Buffer. NOTE: Ended up diluting the pCR2.1/ORF25 by adding an additional 100uL of EB Buffer because it seemed too concentrated for proper quantification using the plate reader. Spec’d plasmid DNA using Teacan plate reader and Pico green dye, according to lab protocol. Spec’ing via the Teacan plate reader is not working (see separate entry regarding this). Plasmids look great; excellent yields and quality. Will prepare some for linearization for use as standard curves and will use some for making a probe for in-situ hybridization. Due to the recent failure of the plasmid standard curve for the withering syndrome qPCR assay, we are creating a fresh plasmid prep. Inoculated 5mL of LB+100ug/mL ampicillin from a frozen stock of p16RK7 C19. Incubated O/N @ 37C on a rocker. Isolated plasmid DNA with Qiagen Mini Prep Spin Kit, using 3mL of culture, according to manufacturer’s protocol. Isolated plasmid DNA from 3mL of each culture inoculated yesterday using QIAprep Spin Miniprep Kit (Qiagen) according to the manufacturer’s protocol. Eluted the plasmid DNA with 50uL of Buffer EB and spec’d on Roberts Lab NanoDrop1000. Samples look fine; good yields, good OD260/280 ratios. Will perform NcoI restriction digests on samples to linearize them in preparation for use in a new standard curve. Inoculated 5mL of 1x LB + Amp (100ug/mL) with colony #2 based off the of the PCR screening on 20120426 in a 50mL conical tube. Incubated @ 37C, 200RPM O/N. Plasmid DNA was isolated using Qiagen’s Mini Prep Spin Kit. Plasmid was eluted with 50uL of Buffer EB and spec’d on the Roberts Lab NanoDrop 1000. Looks good; will proceed with linearization. Ran half of the reaction on a 0.8% agarose low TAE gel, along with ~500ng of undigested plasmid. We see exactly what we want to see: the construct is fully linearized and runs at the expected size (~5400bp). It runs about half way between the 5000bp and 6000bp markers on the ladder. Will quantify and prepare a dilution curve for the RLP qPCR assay. Restriction enzyme was selected based on what the construct should look like and HindIII is a single cutter in this instance. Below is an image of the construct, with the insert (AF133090) in green. Of nine common enzymes, four are indicated in the image below as being single cutters. HindIII was selected based on availability in the lab. 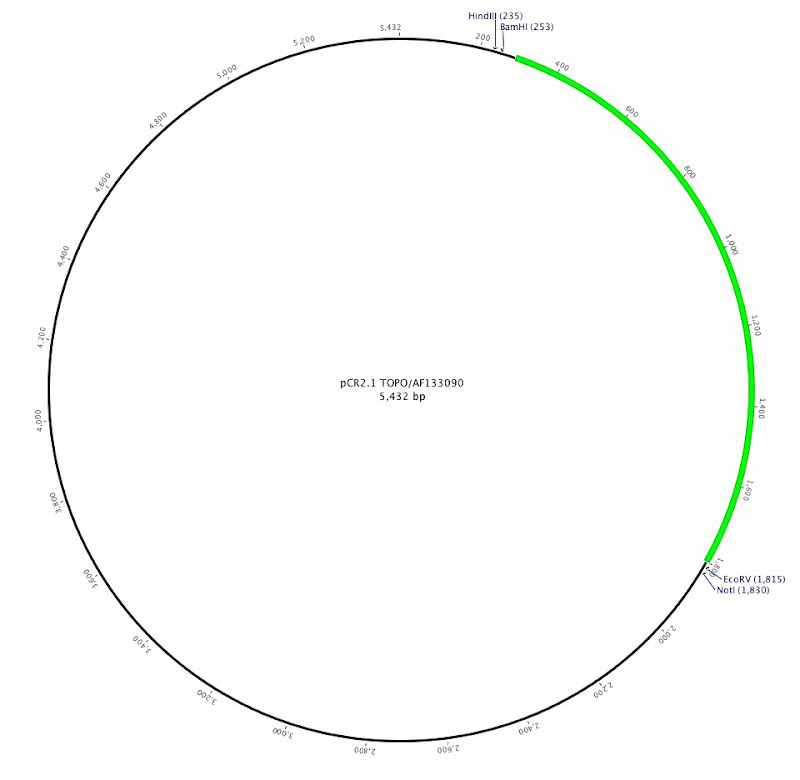 Isolated plasmid DNA from cultures inoculated on 20120409 (p16RK3-C) & 20120410 (p16RK3-A). These cultures finally produced bacteria. Slow growth was likely due to anaerobic conditions (sealed 15mL conical tubes) and slow agitation (on a rocker instead of a shaker). Isolated plasmid DNA using Qiagen Mini Prep Spin Kit according to manufacturer’s protocol. Eluted plasmid DNA with 30uL of Buffer EB and quantified on Roberts Lab NanoDrop1000.